I recommend that you go see Life, Animated, although I have to be upfront about the hugely disappointing aspects of this documentary. First of all, I’ve read quite a bit of praise for the extended animated sequences featured throughout the film. Sure, they’re stunning to look at…but they rubbed me the wrong way. Something about speaking for an autistic man in a documentary about him learning how to find his own voice felt like overstepping. Director Roger Ross Williams should have stayed in his lane. Another major disappointment is that Life, Animated is so structured and polished that you tend to forget it’s a documentary because it feels more like narrative drama. There are some moments when the real people begin to feel like characters, the real struggles begin to feel like plot points and the soundtrack feels like a bit too much. As much as the documentary tries to be equal parts heartwarming and heartbreaking, not unlike the many Disney cartoons mentioned throughout, it often leaves you feeling a bit chilly. Even the science presented in the film, although not totally a missed opportunity, is a bit more of a mixed bag than I would have hoped. 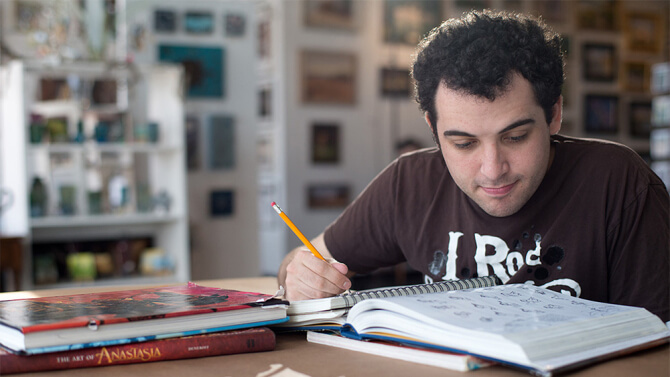 Owen Suskind was three years old when he was diagnosed with autism. Multiple doctors told his parents that the diagnosis meant their son would likely never speak again and Owen would remain completely disconnected from the world. However, it wasn’t long before Owen began responding to classic Disney animated films. At first, films such as Aladdin, The Lion King and The Hunchback of Notre Dame only appeared to excite Owen. Eventually, it became clear that Owen was using the Disney films to teach himself how to communicate with others and interpret emotions. The reasons why are explained briefly, and they’re fascinating. For example, the exaggerated personalities of the animated characters were easier for Owen to study than the inconsistent facial expressions of people. I wish Williams would have addressed the actual science a bit more, but what he revealed was still incredibly interesting. The saving grace of Life, Animated is the story of Owen, and the dilemmas facing him as he enters adulthood. His fears and frustrations about independent living are realized with scattered emotional gut punches that stick with you, even as some of the moments in between feel coldly detached. One scene in particular, where Owen recalls feeling lonely as a child and suggests that his future might be the very same, is downright brutal to watch. Raw moments like that overcome an otherwise overproduced, oversentimental documentary. Yes, I suggest that you go see Life, Animated. It’s a flawed documentary, but not necessarily a bad one. Part of me wants to see Owen’s story reexamined by another filmmaker, preferably one that will let Owen mostly speak for himself. More focus on the science behind Owen’s breakthrough and less glossy filmmaking would also be nice. Owen’s story is so interesting that it’s worth retelling, and it’s the key element holding Life, Animated together.